Four teams take the field for two NFL conference championship games this afternoon, but the best team working might be in the broadcast booth — specifically the Fox Sports booth. Play-by-play man Joe Buck and analyst Troy Aikman have put together their busiest and best season. This afternoon’s Rams-Saints game will be their last broadcast of the season after working a full slate of Thursday night and Sunday games. Buck, a seven-time Emmy Award winner who often gets a lot of unnecessary criticism for his work, pointed to the busier schedule as a reason for their standout season. Whatever the reason, he’s right. They have sounded better. 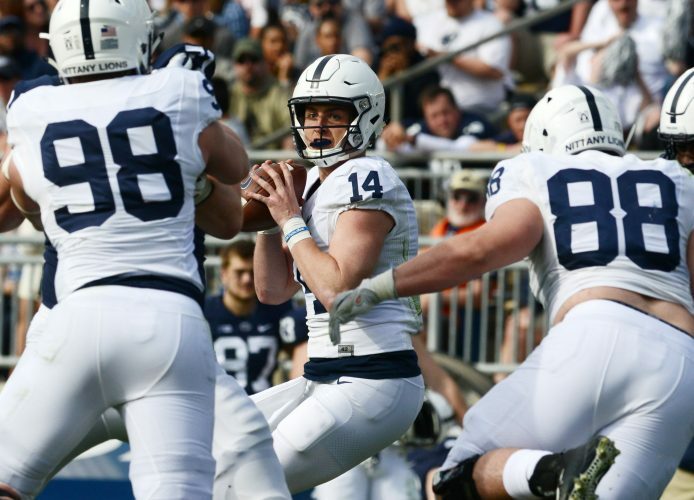 And their work, complemented at times and driven at others by the visuals selected by director Rich Russo (a Penn State alumnus) has been strong since the start of the season. Plus, Fox Sports benefits from rules analyst Mike Pereira, the best in the business at that job. Conversely, CBS Sports, which has the second game this afternoon (Patriots-Chiefs), features a No. 1 team of Jim Nantz and Tony Romo. While Romo remains different and sounds fresh compared to some other TV analysts, he endured a bit of a sophomore slump this season. He’s insightful and seemingly joyful at times but also a little too talkative. He’s not as polished or stiff as some — a good thing in general — but it can sound boyish and overly excited or uninformed at times. Still, he’s generally solid and the Nantz-Romo team will work one more game because their network has the Super Bowl. The accepted practice of NFL broadcasters not mentioning gambling or point spreads during games seems antiquated and somewhat silly months after the Supreme Court issued a ruling that allowed states to conduct sports wagering. It does not need to be a driving factor in game coverage, but an acknowledgement from time to time would not be unsavory. At the same time, continual criticism of the approach by broadcasters like Al Michaels of NBC or Brent Musburger, who does Raiders radio and works for Vegas Stats & Information Network, is similarly silly. Offhand, not-so-subtle gambling remarks by those two during games seems pointless. Thankfully NBC Sports does not have one of the NFL conference championship games to broadcast because we’ll be saved from another look — although it was always mostly a non-look — at the network’s “green zone” during game coverage. NBC unveiled the technology, which highlighted the space on the field a team needed to gain a first down in a brighter-than-usual green color, at the start of this season. It was a mistake from the beginning and worked inconsistently, never really serving viewers well. Plus, the effort was redundant because viewers have long been accustomed to the fully functional and well-accepted yellow line as an indicator for first downs. For as much as NBC does well (and there is a lot, including Cris Collinsworth), and for all the technology networks try to use to make broadcasts better, the “green zone” was not among those things. n ESPN’s refusal on its Bottom Line to show other networks that broadcast games is a disservice to fans. Ironically, the all-sports network states that serving fans is its core value. Sure, ESPN shows games that air on the ACC or SEC networks, which it owns. But if games air on the Big Ten Network, CBS or NBC, that information will not be shared. It’s dumb. n As teammates and team officials comment, and ex-teammates pile on via social media, it continues to be hard to imagine receiver Antonio Brown returning to the Steelers. So far at least, the receiver seems to be losing the battle to control the media messaging. n Although fans in our region got the game from start to finish (despite the Chargers-Patriots divisional playoff game running long), most of the nation joined last Sunday’s Michigan State-Penn State men’s basketball game with 14:33 remaining in the first half. CBS Sports, which aired that game, was prepared with an on-screen graphic about road losses by top teams to unranked teams in the previous week. That said, then-No. 6 MSU was never really threatened by the Nittany Lions. n Kudos to Steve Jones of Penn State Sports Network for always trying to provide context to the team’s struggles. If you did not already know that the team’s schedule was second- or fourth-toughest nationally (depending on the source), he’s been sure to share that information. Regularly. He also points out the team’s overall youth. Still, to some Jones’ expertise and solid preparation probably sometimes sounds a bit like excuse making.